"Got some good steaks in the fridge, but the weather isn't cooperating with your grilling plans? Try stir-frying your steaks in this Chinese-inspired dish with mixed Asian ingredients. Quick and easy, always a hit!" Mix oyster sauce, soy sauce, and mirin together in a small bowl to make sauce. Heat 1 tablespoon oil in a wok or large skillet over high heat until shimmering, about 1 minute. Add red onion; cook and stir until golden, about 1 minute. Transfer to a plate. Heat remaining 1 tablespoon oil in the same wok over high heat. Add steak; saute to desired doneness, 3 to 5 minutes. Transfer to a plate, reserving juices in the wok. Return onion to the wok. 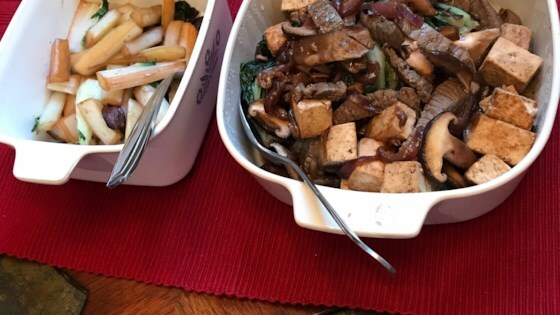 Stir in bok choy, tofu, and enoki mushrooms. Cook and stir until tofu is heated through and bok choy is wilted, about 3 minutes. Return steak to the wok. Stir in sauce, tossing to coat.